SEOUL, South Korea — A political ally of South Korean President Moon Jae-in on Wednesday received a two-year prison term for his involvement in an online opinion rigging scandal. The conviction of South Gyeongsang Gov. Kim Kyoung-soo is a blow to Moon, a liberal who is struggling to revive stalled negotiations on North Korea's nuclear program and address diverse economic woes at home. The Seoul Central District Court said that Kim was immediately arrested after his conviction. He was to be held at a detention facility near Seoul, a court official said, requesting anonymity citing department rules. Both Kim and prosecutors have one week to appeal. If Kim's prison term is upheld in higher courts, he will be stripped of his governor post, the court official said. The court gave no further details. But local media reported Kim allegedly colluded with a power blogger to sway online public opinion to support Moon ahead of the 2017 presidential election. Moon isn't directly involved in the scandal. His office called Kim's conviction "totally unexpected." 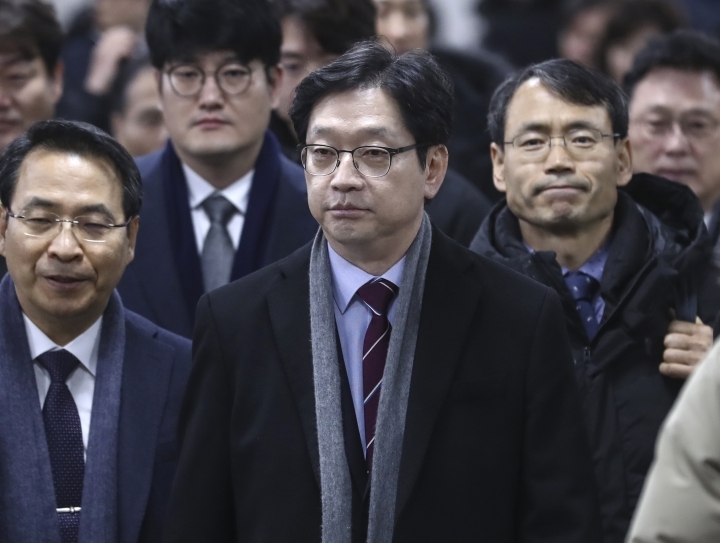 "We will calmly watch until the final verdict" by the highest court is issued, said presidential spokesman Kim Eui-kyeom. The 2017 election was held after Moon's conservative predecessor Park Geun-hye was removed from office for corruption. It was unclear how much Kim's opinion rigging helped Moon's campaign. He won an easy victory while South Korean conservatives were badly hurt and split over the Park scandal. The opinion rigging scandal is widely viewed as ironic as Moon was a victim of a smear online campaign launched by South Korea's spy agency to help Park defeat him ahead of the 2012 election, when Park's conservative predecessor Lee Myung-bak was in power. High-profile corruption scandals routinely take place in South Korea, Asia's fourth largest economy, which achieved democracy in the late 1980s following decades of military-backed dictatorships. Nearly all South Korean presidents have been arrested or embroiled in scandals at the close of their terms or after leaving office. Both Park and Lee are serving lengthy prison terms over separate corruption scandals.